First set up in 2018 to formalise a long line of charity work, the Eventmasters Foundation has proudly supported a wide range of charities both locally and nationwide. Previous partners include the likes of Help For Heroes, Macmillan Cancer Support, Acorns Children’s Hospice and the London Fire Brigade. Each year there’s a rigorous selection process including extensive research which sees a minimum of three charities chosen for continued support and partnership over a 12 month period. In 2018 we were thrilled to support Scotty’s Little Soldiers, Queen Elizabeth Hospital and Love Brum. Our partnership with Scotty’s Little Soldiers has too continued into 2019 and we look forward to working with them throughout the year. Although not an official partner for 2019 we still remain a patron of the Birmingham based charity Love Brum. As we are too based in Birmingham we have thoroughly enjoyed supporting a charity right on our doorstep. We would love to share with you the work that they do & share some of the impact the great charity has had on the Birmingham area. The registered charity has a main focus on supporting “hidden gem” projects throughout Birmingham. With particular focus on those that encourage volunteer work and result in positive outcomes for the community. The aim is to support causes throughout the city that don’t have accessibility to the platform they need to reach audiences and make a real difference. These are referred to by the charity as “hard to reach projects”. The selected causes are given a platform to help them grow, nourish and make a wider impact than what could be achieved unsupported. Members of the charity are asked each month to vote for a cause they think will benefit most from funding. Previous causes have focussed on youth employment, supporting those with learning difficulties and tackling elderly isolation. This is great exposure for the work of the smaller charities or volunteer led groups allowing them to reach a wider audience in and around Birmingham. This month is Animals Month at Love Brum where three proposed causes will focus on the welfare and rehabilitation of animals. We are proud sponsors of this month and are loving working with the team on this to help animal based charities throughout Birmingham. So far two causes have been highlighted by Love Brum with the third one coming soon. The first proposed project comes from Birmingham Dogs Home. A fantastic charity run service located in Solihull in Greater Birmingham that help rescue and rehabilitate stray and abandoned dogs throughout the city. First established in 1892 they have sustained a presence in Birmingham worthy of praise. Their proposed project requires funding of £2000 which will be used to purchase an ultrasound scanner to help with quicker detection of illnesses in dogs. The second project comes from the Wythall based Fur and Feathers Animal Sanctuary. The not for profit charity provides “rescue spaces” for a wide range of animals including horses, pigs, cats and chickens to name a few. The volunteer team work to rehabilitate and nurture the animals before finding them a happy home. Relying solely on donations the charity will benefit hugely from extra funding from Love Brum. The £2,000 project will be put towards the installation of a fresh water supply and replacement of equipment and pens which had to be destroyed following a previous outbreak of Parvovirus. As we mentioned there will be a third cause which Love Brum members can vote for which too focuses on the support and nurturing of animals. We look forward to seeing the outcome of the projects and seeing which charity will be rewarded with extra funding. Alongside such patron work the Eventmasters Foundation will be closely supporting three charities throughout 2019 through our official partnership programmes. Our 2019 charity partners are Prostate Cancer UK, Birmingham Children’s Hospital and again Scotty’s Little Soldiers. We aim to support the charities through a wide range of activities. Our sister company Silent Auction Events supports fundraising for our chosen charities throughout the year through silent auctions at a range of events. 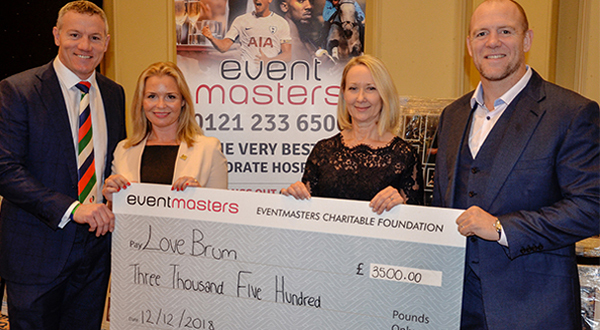 A silent auction was previously held at the Curry King Of Birmingham in November 2018 hosted by Love Brum. All money raised from the auctioning of VIP experiences and signed memorabilia went to Love Brum. With a final presentation and auction at the end of the year at the Annual Midlands Sportsmans Luncheon. We look forward to working with our chosen charities in a variety of different ways throughout the year. We offer much more than just funding support. We help with exposure and awareness for our chosen charities helping them to reach wider audiences, our longstanding position in corporate hospitality allows us to connect charities with our large network of business professionals and corporates which can too help grow the awareness of the charity. Let us tell you a little more about our 2019 charity partners. Back for a second year we are thrilled The Foundation will be working alongside Scotty’s Little Soldiers again. First established in 2010 the charity proudly supports children that have lost parents who have passed away whilst serving in the armed forces. This is a fantastic charity that recognises the support needed for the family members affected by such events. Their support is separated into three different parts and referred to as “smiles, support and strides”. The Smiles initiative supports those affected with outings and special gifts which as the name suggests hopes to make the children smile again. The Support programmes go a little further than this and help those families affected with family counselling and other support initiatives. The final stage of the support offered referred to as Strides offers grants and assistance with education and youth development. All three initiatives are fantastic ways to help those affected by the loss of a family member and work towards a light at the end of the tunnel. Throughout 2019 we will be acting as a “Business Hero” for the charity. This initiative was first introduced to allow businesses and local companies help make a real difference through a wide range of activities including networking and fundraising events and social media activity. A new addition to our charity partners is Prostate Cancer UK. The Foundation is pleased to be supporting this fantastic charity whose main goal is to stop men dying from cancer. More than 40,000 men are diagnosed with Prostate Cancer each year which is a staggering amount. Their work involves researching radical improvements in diagnosis, treatment and prevention. They too want to bring more awareness to this cancer type and help support men affected by the illness. Throughout 2019 we will be working on developing awareness of the charity and the illness that affects so many men year on year through a wide range of activities. We are thrilled The Foundation will be working with Birmingham Children’s Hospital throughout 2019. This fantastic hospital is devoted to helping sick children and teenagers and saving many lives on a daily basis. In 2017 the hospital was rated “Outstanding” by the Care Quality Commission and are world leaders in some of the most advanced treatments and research developments. The hospital has cared for children with illnesses for well over 150 years, a staggering amount! The hospital is a statement piece of the Birmingham community and NHS service. We feel very fortunate to have access to such a fantastic hospital and services. Their mission is to raise the necessary funds which will help make a significant difference to all who use the hospital’s services. They constantly strive to work towards supporting families and patients and with the support of The Foundation we hope we can help get them closer to reaching their aims. Overall, the work of Eventmasters Foundation aims to have a lasting positive impact on the wider society and all those impacted by the work of the charities we support. We can’t wait to see what 2019 brings and what great things we can all do to help support local charities. Be sure to keep up with our Animals Month project with Love Brum throughout February and keep an eye out on our dedicated Eventmasters Foundation page for upcoming events.